Laurel Glen Vineyard, a thousand feet up the east facing slopes of Sonoma Mountain, has long been considered one of the iconic Cabernet vineyards of California. Originally planted in the 1880’s; the present day vineyard was developed in the 1970’s by Sonoma wine pioneer Patrick Campbell. The vineyard’s combination of high altitude, eastern exposure, rocky soils, and small diurnal temperature swings combine to produce very distinctive wines. The Laurel Glen clone of Cabernet Sauvignon was recognized as a unique clone by UC Davis in the mid-1990’s. Beginning in 2011, Laurel Glen introduced organic farming practices at Laurel Glen Vineyard and upgraded pruning and trellising methods in order to improve concentration and consistency. As the changes made in the vineyard take effect, the quality of the fruit has increased, but the quantity of the fruit has decreased. 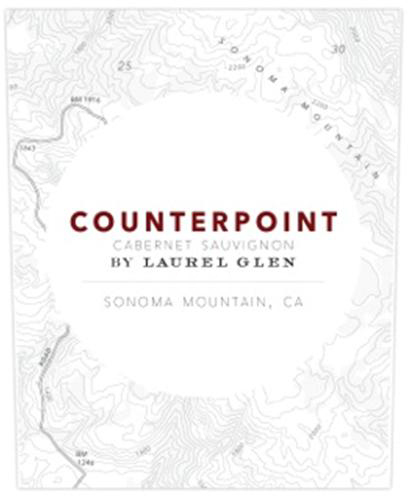 In order to continue making the same amount of Laurel Glen Counterpoint Cabernet as before, Laurel Glen has been developing relationships with some quality oriented neighbors on Sonoma Mountain. In addition to fruit from their estate vineyard, Counterpoint benefits from Cabernet Sauvignon and Merlot from the venerable Pickberry Vineyard, now farmed by Ned Hill, and Cabernet Sauvignon from the Murray Vineyard, also farmed organically. Vintage Notes: Mother Nature both blessed and cursed us in 2015. The Cabernet Sauvignon fruit we harvested at Laurel Glen Vineyard was of exceptional quality. We picked unusually tiny, intensely flavored berries. However, the quantity of fruit was heart breaking. Our yield in 2015 was less than half of what we harvested in 2014. The fruit undergoes maceration for two to four days until natural fermentation begins in small open top fermenters. It is manually punched down three times daily and the cap is irrigated, but otherwise receives gentle handling with emphasis on gravity flow. The wine is aged 18 months in predominantly Taransaud French oak barrels and a small number of Canton American oak barrels. Forty percent of the barrels used are new.